Swarved Mahamandir, as the name suggests, is The Temple of Spirituality. It is the sublime zone of consciousness which provides a platform and meeting ground for seekers of the truth to experience the existence of Conscious Entities beyond the perception of Physical Sciences itself. 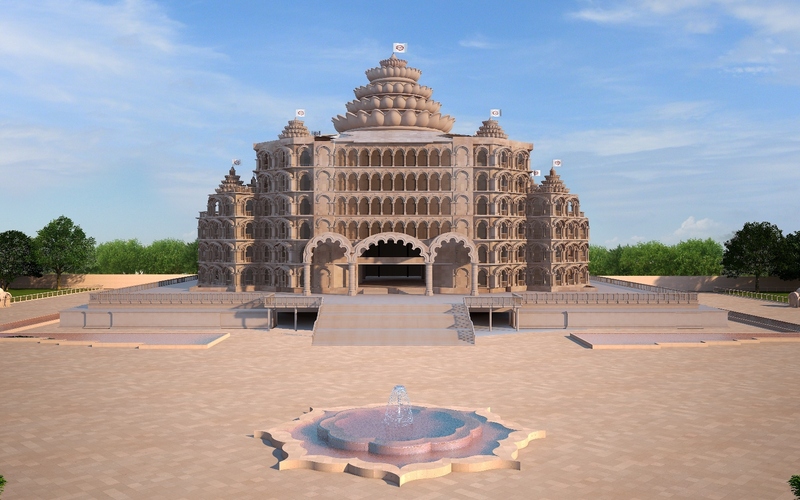 The Swarveda Mahamandir is dedicated to the Swarveda, a unique Spiritual Scripture which is providing unmatched resonance and energy to the world; establishing peace, harmony and love whilst strengthening the spiritual awakening of society at a micro and macro-level. The foundation of the Mahamandir, the Swarveda, is a divine spiritual scripture written by His Holiness, Sadguru Shri Sadafal Deoji Maharaj – an eternal Yogi and Founder of Vihangam Yoga. The Swarveda propagates the message of Brahm Vidya, a body of knowledge which empowers those who walk the spiritual path to remain in a state of consummate Zen – a state of unyielding constancy in peace and happiness, which verily enables the accomplishment of their goals and aspirations. The Mahamandir is to illuminate the humankind with its magnificent spiritual aura and engulf the world in a state of peaceful alertness; indeed, the rise of spiritual inquisition will inspire a different way of thinking about the world and existence itself in current and future generations; thus allowing us to progress as a common humanity. In a modern era riddled with intense hatred and animosity, the Swarved Mahamandir will establish itself as an irreplaceable source of inspiration, peace, and harmony – with a deep reflection on the prominence of internal inquiry. Centre of research to know the conscious entities. 3137 Swarved verses engraved on Makarana Marble. Over 20,000 people can sit together and meditate. Mechanic presentation on the Life of Sadguru Sadafal Deo Ji Maharaj. Subsumes the eradication of social vices and social evils. Pink sandstone decor surrounding the Mandir's walls. Exquisite garden featuring medicinal herbs.